This summer the Randolph County Community Arts Center is hosting a museum quality exhibit of Civil War art. 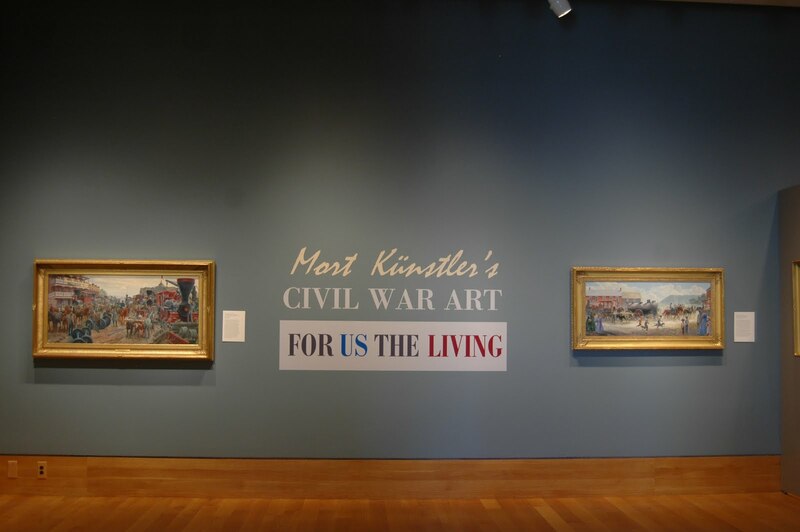 The collection which features the artists mentioned below, represents the best of Civil War art, painstakingly crafted using historical documentation. 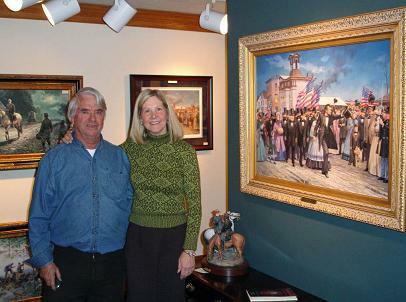 Doreen Hall, a founding member of the art center board and gallery coordinator worked tirelessly on obtaining a museum-quality collection for the community. Hall explains the social relevance of the Civil War in Elkins, West Virginia as profound, “everyone in the community has a connection to the Civil War because of our location and the events that took place here 150 years ago” she comments. The Elkins area saw the first land battle of the Civil War in 1861. This area was extremely important to the North and South because of the B&O Railroad. During the 1800’s West Virginia was part of Virginia and the land within a 30 mile perimeter of Elkins saw ‘turf wars’ as General George B. McClellan (Union) moved 20,000+ troops to the area from Ohio and Indiana to control the railroad. McClellan and his men were victorious and secured the location as a northern territory. “Many outsiders forget what happened here in the Elkins area,” Hall explains, “We wanted to honor our history with visual representations. Many people glass over this area and the fighting, we wanted to show it.” The Randolph County Community Arts Center wanted to put a collection together for some time but struggled with ‘getting it right.’ She originally hoped the Community Art Center would obtain a slot for the traveling gallery of Mort Künstler’s works but the exhibit was booked from New York to Georgia, so she turned to the phones. With the assistance of sesquicentennial-celebration grant money, trustees, and persuasion, Hall started researching artists and cold-calling them to ask if they would loan a piece of artwork for display. She said some were skeptical at first but when she shared with them her location, history, and followed each phone call with a letter explaining the importance of the area to the Civil War, they agreed. Hall’s goal is to share with the people of her community, state, and country the importance of the Civil War and educate them about their own local history. She believes the quality of the artwork stands as a reflection of the passion of individuals to preserve our American story. The exhibit in Elkins has been extremely popular, drawing three displayed artists to various receptions held at the Center and inviting hundreds of visitors, free of charge, into the echoes of the past. The Civil War was a pivotal moment in our nation’s history. Captured through thousands of still photographs, journal entries, sketches, first-hand accounts, oral history, newspaper reports, official reports, declarations, and telegrams, the war takes on a life of its own. Thousands of reenactors and history buffs take to battlefields to draw connections with the past but this can also be achieved though a painting. Historically accurate paintings of the Civil War allow for clear visual representation that not only is aesthetically pleasing but also teaches generations about their relatives and fellow countrymen. The paintings themselves capture a period of time when America was divided, a novel idea to a child growing up in the 21st century. It is through this art that education spawns. When a museum, community center, school, or individual takes an interest in preserving the past, generations become educated about their own society and how the actions of the past helped shaped results in the future. 150 years ago, the North and the South fought and killed their geographical neighbors. 150 years later, we as a collective society gaze into the eyes of General Robert E. Lee, General Ulysses S. Grant, confederate and union soldiers and feel a connection. 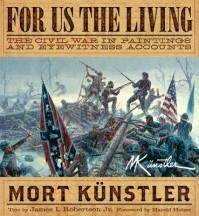 The Booth Western Art Museum in Cartersville, Georgia is celebrating the Sesquicentennial of the Civil War with the Civil War works of Mort Künstler. Booth Western Art Museum focuses on Western American Art and boasts over 120,000 square feet of Civil War art, Presidential portraits and letters, Western movie posters, and Western illustration. Künstler’s art was well received at the opening on April 2, 2011 with people inquiring on purchasing many of the works. Künstler’s daughter Jane said she was taken aback by the interest in purchasing an original Künstler Civil War painting and hadn’t even come prepared with prices. “It’s an exhibit in a museum, I never expected to sell three paints right away,” she said. The interest in Künstler’s art spans all ages and genders. Jane points out that 50 percent of Künstler’s audience and costumers are women. While he believes in capturing the events of the Civil War this hasn’t limited Künstler to strictly battle scenes. 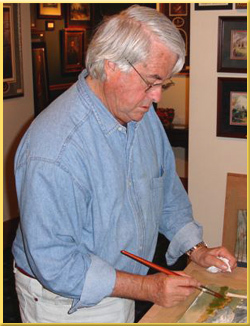 He has done many works that depict the love, emotion, and rejuvenation between the ‘characters’ of the Civil War showing a national audience that these were real people who had real emotional hardships. The Booth Western Art Museum is located in Georgia and as a Southern state, some areas of the country are uncertain about celebrating the anniversary of the Civil War. Yet Künstler’s exhibit show’s both sides of the war and his paintings evoke such powerful feelings that it almost feels as though the Confederate and Union soldiers are used to being displayed together as more of a collective look and feel, versus a segregated distance. Perhaps this exhibit will elicit the feeling of a United America, turning brother versus brother back to the commonality of fraternity. For Us the Living, with a name that binds rather than divides, represents 150 years later, the rejoining and strength of our nation. 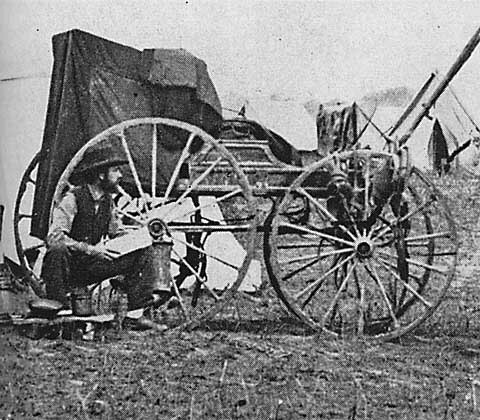 Mathew Brady was one of the first photographers to capture the perils of the Civil War, starting with the Battle of Bull Run in 1861. Brady was born in 1823 in Warren County, New York. The son of Irish immigrants, he mastered the craft of taking photographs and developing plates with precision. He photographed the Battle of Bull Run and started a successful business that employed photographers who also captured the bullets of the Civil War. Brady got his start in photography under the tutelage of daguerreotypist Samuel F.B. Morse. Realizing that he had a talent for photography, he opened a gallery in New York City shortly after learning the craft. Brady understood the importance of capturing figureheads, politicians, events, and interesting people realizing their historical relevance. He was the first photographer to capture famous people in the United States and felt a moral obligation to capture history for future generations. The father of photojournalism, Brady is quoted saying, A spirit in my feed said go, and I went. His first encounter of Civil War photography was at the Battle of Bull Run. This turned out to be a very real introduction to the dangers and perils of war. Brady got lost for three days, disoriented, and almost starved to death during the confusion of Bull Run. He ended up in Washington, DC and became the foreman of Civil War photography. Brady hired Alexander Gardner, James Gardner, Timothy H. O’Sullivan, William Pywell, George N. Barnard, Thomas C. Roche, and seventeen other men to photograph battles taking place during the Civil War. He invested over $100,000.00 of his own money to fuel the efforts, sending wagons equip with dark rooms, equipment, and materials needed to create over 10,000 plates. Brady’s efforts were tireless in capturing the historical event in our nation’s history. He passed away underappreciated, alone, and financially destitute.